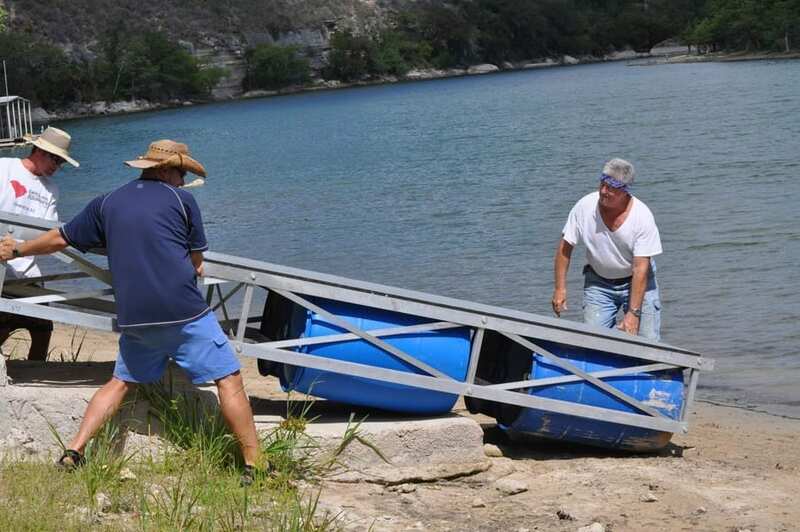 In Southern Texas, four brothers own lake frontage and had been looking to build a good size dock and gangway. We ended up building them a kit that included a 16×16 floating dock, a 24×4′ floating gangway, and an 8×4′ walkway. At the time it was the largest kit that was ever assembled by a customer without any onsite help from us. The had a great time assembling and launching their new dock with three generations of family members working together to make it happen. This dock uses our 16″ tall “Piling Guides” that bolt to the corners of the dock. 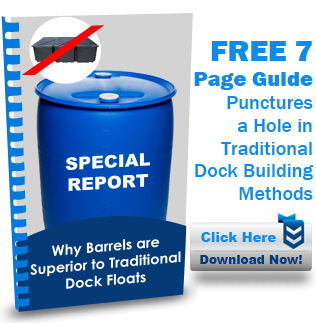 These allow a 2″ galvanized pipe to be used as pilings to keep the dock in place. The advantage of Piling Guides is that they hold the pilings upright, so the pilings only need to be driven into the lake bed deep enough to keep them from sliding along the bottom (usually only a 3-4 inches).